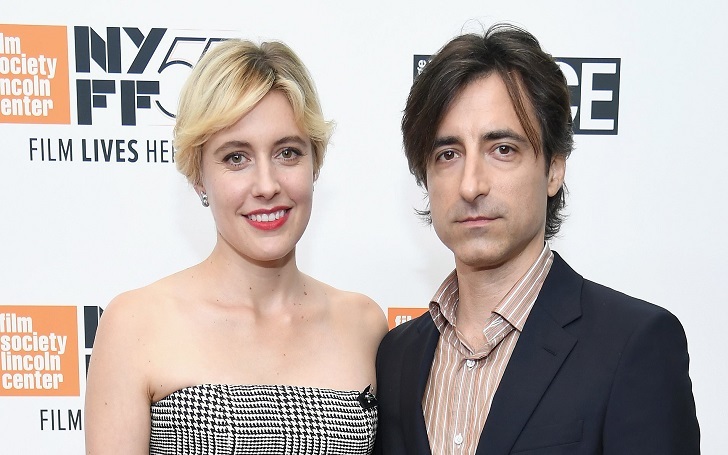 Congratulations are in order for Greta Gerwig and Noah Baumbach! The Lady Bird director has given birth; she and her longtime boyfriend have secretly welcomed their first child, a baby boy, together. A source exclusively told Us Weekly that the couple is now parents of an adorable son. The actress35, and the Mistress America writer/director, 49, sparked speculation that they secretly expanded their family after being spotted walking with a baby stroller in Manhattan, New York City, on Tuesday, March 19. Of their outing, an eyewitness told E! News on Wednesday, March 20, "Noah was pushing and Greta was right next to him. They were chatting and enjoying some fresh air." They were bundled up in the chilly weather and they had a gray and white striped blanket draped over the stroller. It seems like the baby was sleeping because they were busy talking and didn’t have to tend to the baby. The secretive couple who first met while she was working on his film Greenberg in 2010 and eventually began dating late 2011. Greta told The New Yorker in April 2013 that she was in a relationship with someone else but ultimately parted ways after she realized that she was in love with Noah. The pair collaborated on Frances Ha in 2012 and Mistress America in 2015. They like to keep their romance low-key. However, in February 2018, the duo was spotted together at the Academy Awards where the actress' film Lady Bird was nominated for Best Original Screenplay and Best Achievement in Directing. This is the first child for the couple together. However, Noah is also the father of a son, 9, Rohmer Emmanuel Baumbach, who he shares with his ex-wife Jennifer Jason Leigh.